The satellite photo showing the distance and location of Amolator District from Kampala. 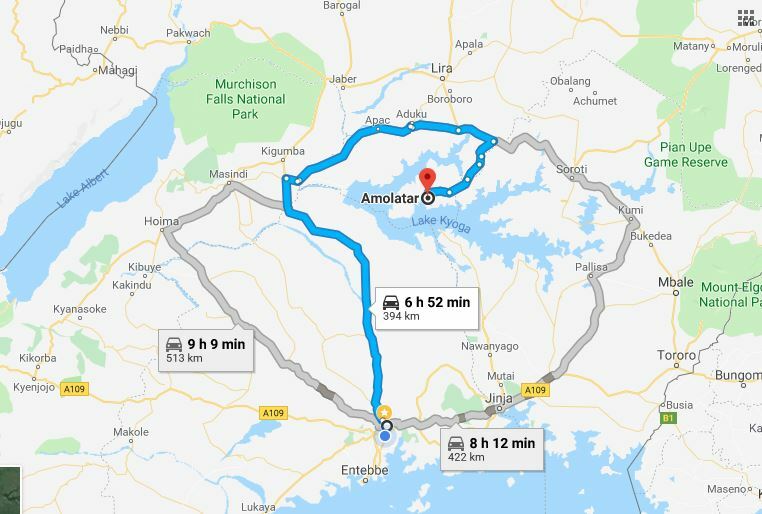 AMOLATAR – Mr. Bob Amuka, a teacher believed to teach in one of the secondary schools in Mpigi District in was on Tuesday, February 27 found dead in a lodge in Namasale Town Council, Amolatar District northern Uganda. Local authorities said, he is a resident of Ojem village, Arwotcek Sub-County in Amolatar District and that he believed to have checked in the lodge on Monday, February 28 evening on his way to Mpigi as his last destination. The deceased was discovered dead by a cleaner today morning as he was going to his usual cleaning duties. According to Mr. Flamingo Okwir, the LCII chairperson for Namasale Central Ward no post-mortem examination had been performed to ascertain what could have caused his death. “The police indicated that they were bringing a doctor to carry out the post-mortem,” Mr. Okwir said. Amolatar District police commander, Mr. Samuel Abedi, said that they had started investigating the cause of the teacher’s death. “We have started our investigations,” Mr. Abedi said.